Residency Notes » Blog Archive » So…Is That A 'No'? 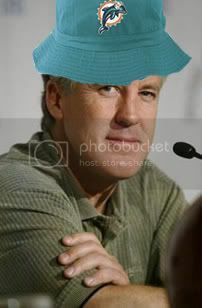 Rumors have swirled that the owner of the Dolphins visited Pete Carroll on vacation in Costa Rica. Well, those aren’t rumors. He did. And he talked about the Dolphin’s head coaching vacancy. But with Carroll on vacation and unresponsive to media inquiries rumors swirled that his hiring was imminent. Now he has returned and held his first news conference. His answers were noncommittal. But he was open, more so than say, Saban was. Though coach Pete Carroll says he’s committed to staying at Southern California, he seems intrigued by the ideas of Miami Dolphins owner Wayne Huizenga. “I’m thrilled to be here,” he said. “As I’ve been the whole time, I haven’t wavered. I know that being curious about it has helped me appreciate what we have here. Personally I think there’s only one way to read this. He was not offered the job. Which may still happen. But if he was offered the job the odds are better than 50-50 that he would take it. The Dolphin’s are being incredibly methodical in their search. As cited in the link above they plan a few more interviews and then to whittle the list to five and conduct another round of interviews. It will be ominous if Carroll is there again. So, why would Carroll leave? This is supposedly his best recruiting class ever (which he isn’t helping with this Dolphin’s talk…so he must be seriously considering it rather than just dipping his toes). He’s well paid and will probably be better paid soon. He has a chance to become one of the greatest college football coaches of all time. Carroll, while a pretty even keeled person, has let it be known he doesn’t like the perception that he was an NFL failure and his style is more situated for college. 2. Carroll is in a position to know more about the potential consequences of Reggiegate than any outside fan. If he thinks all he has worked for might come down in the next few years it would be a strong incentive to get out. 3. More money. Fans make it out like coaches’ already have all they need. But wouldn’t you jump jobs for a raise? True that isn’t everything, and I doubt it would be the primary influence in Carroll’s decision but it has to play a roll. 4. Things might not be going too well between Carroll and some of the USC administration. “There was an issue about paying Carroll top $$, and some dissention between the trustees and Sample. Briefly, Sample was balking at a big raise, the kind Carroll wanted, and the trustees were split about what to do. Evidently, the trustees are going to get what they wanted (making Carroll the highest paid employee in the history of the university), and Sample has agreed. I wrote about this Sample/$$ issue when the Costa Rica thing came up. I have no idea if the two are related, or if it was just a coincidence. I do know, however, that Carroll was pissed at Sample. It’ll be more than the raise and contract extension alluded to because Carroll can almost certainly make more money with the Dolphins. It’ll be about the relationship between Carroll and his boss…which if we take this hearsay as fact appears to have taken a southward turn of late. ESPN 710 in Los Angeles is reporting, as is Scott Wolf, that Dwayne Jarrett will announce tomorrow that he is entering the NFL draft. I think it is the right move for him. Of course, I’d love to have him back. Maybe he’ll pull a surprise Matt (of course Leinart was injured).